Well, that's gone and done it. I was pretty happy in my relative ignorance of Rare's open world, online co-op pirate adventure Sea of Thieves, but now—after watching the following videos—it is a game I must play, one way or the other. 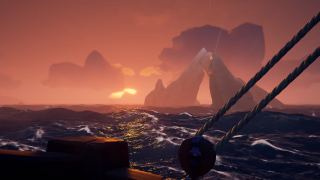 Joe 'Bluebeard' Donnelly took a look at the first 'developer gameplay' video back in February, in which a bunch of Sea of Thieves devs and Insider Programme members played the game together, getting into all sorts of buccaneering mischief. Since then, a second dev video has appeared, and now a third, both of which I'll link below. Sea of Thieves will be a Play Anywhere (cross-buy) game for PC and Xbox One, and I hope it finds an audience, because it looks like a lot of fun.